Step out of Patong to go to Chalong and see Phuket Big Buddha, which is approximately 46 minutes away. Spend the 27th (Fri) among aquatic life with a scuba or snorkeling tour. On the 28th (Sat), spend an adventurous day with a kayaking and canoeing tour. There's still lots to do: kick back and relax at Patong Beach, look for gifts at Instyle Fashion, stroll through Karon Beach, and take some stellar pictures from Karon View Point. To find other places to visit, ratings, reviews, and tourist information, refer to the Patong online driving holiday planner . Chandigarh, India to Patong is an approximately 10.5-hour flight. You can also do a combination of train and flight; or drive. You'll lose 1 hour traveling from Chandigarh to Patong due to the time zone difference. In April, daytime highs in Patong are 38°C, while nighttime lows are 28°C. Cap off your sightseeing on the 30th (Mon) early enough to travel to Chiang Mai. Venture out of the city with trips to Grandma's Thai Recipes (in Mae Rim) and Wat Phra That Doi Suthep (in Doi Suthep). Spend the 1st (Tue) wandering through the wild on a nature and wildlife tour. And it doesn't end there: explore the ancient world of Wat Chedi Luang Worawihan, take in the spiritual surroundings of Wat Phra Singh, look for gifts at Mesimu, and meet the residents at Chiang Mai Zoo. To see where to stay, photos, other places to visit, and more tourist information, read Chiang Mai driving holiday site . Fly from Patong to Chiang Mai in 3 hours. Alternatively, you can drive; or take a bus. Traveling from Patong in April, expect nights in Chiang Mai to be about the same, around 28°C, while days are a bit warmer, around 43°C. Finish your sightseeing early on the 4th (Fri) to allow enough time to travel to Bangkok. Spend the 9th (Wed) exploring nature at Dong Phayayen-Khao Yai Forest Complex. 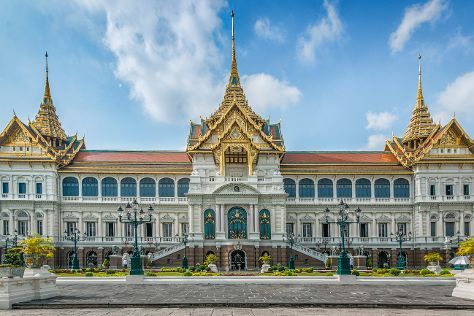 And it doesn't end there: explore the historical opulence of The Grand Palace, buy something for everyone on your list at Siam Paragon, contemplate in the serene atmosphere at Temple of the Emerald Buddha (Wat Phra Kaew), and head outdoors with SEA LIFE Bangkok Ocean World. To find photos, ratings, and more tourist information, you can read our Bangkok online holiday planner . Fly from Chiang Mai to Bangkok in 3 hours. Alternatively, you can drive; or take a bus. Expect a daytime high around 41°C in May, and nighttime lows around 32°C. Finish up your sightseeing early on the 9th (Wed) so you can travel back home.